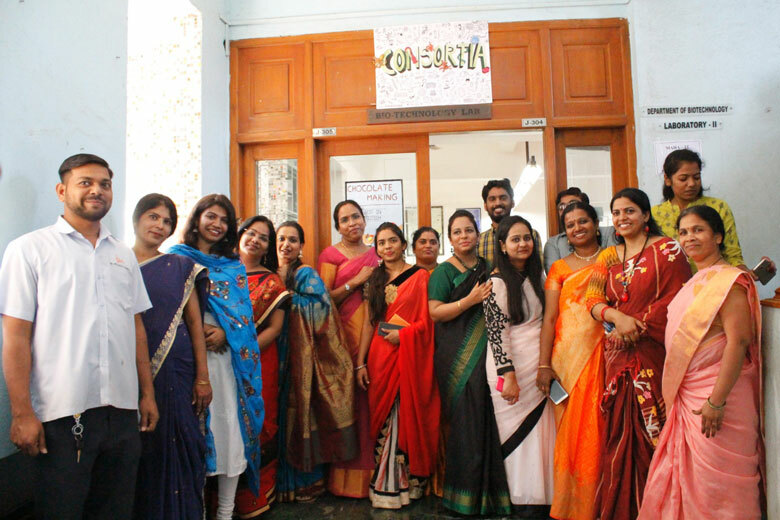 Consortia - transforming minds, translating idea for the academic year 2018-19 was held on 15th February, 2019. The registration began at 8:30 a.m. for all the events. Consortia means “Association or Conglomeration” and serving justice to its meaning this fest is organised with the goal of providing a platform for the students to exchange ideas and showcase their hidden talents and skills. The Chief Guest for the fest was Dr. Neetin S. Desai, Director, Amity Institute of Biotechnology. The fest began at 9:30 a.m. with the inauguration at the auditorium of lighting the lamp. The chief guest was felicitated by Mrs. Meenakshi Johri, In-charge of Biotechnology Association. It was followed by 2 minutes of silence for the martyred soldiers of the Pulwama attack. 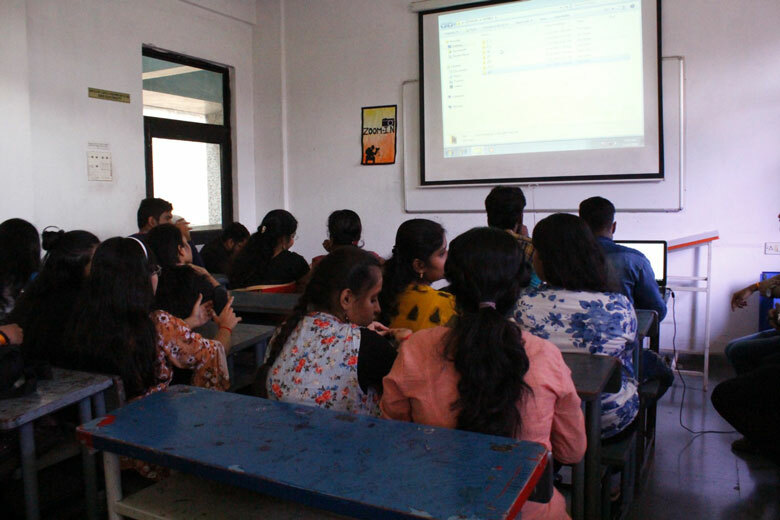 The chief guest Dr. Neetin S. Desai enlightened the students with a small talk about the importance of Biotechnology. The official inauguration was done with a welcome speech by Mrs. Meenakshi Johri. The first event of the fest was ZOOM IN which was based on the theme “EMOTIONS”. 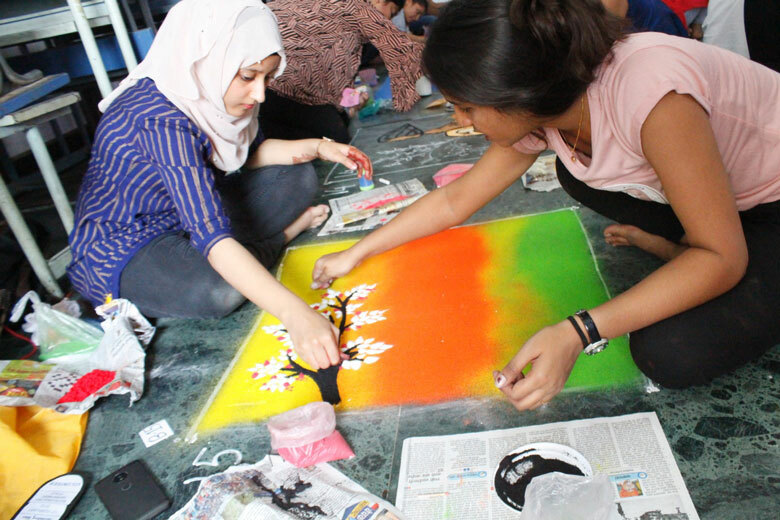 Participants were of given time duration of 2.5 hours. It was followed by CHAIN REACTION. This event was extremely interesting and was to evaluate the memory power of the participants. 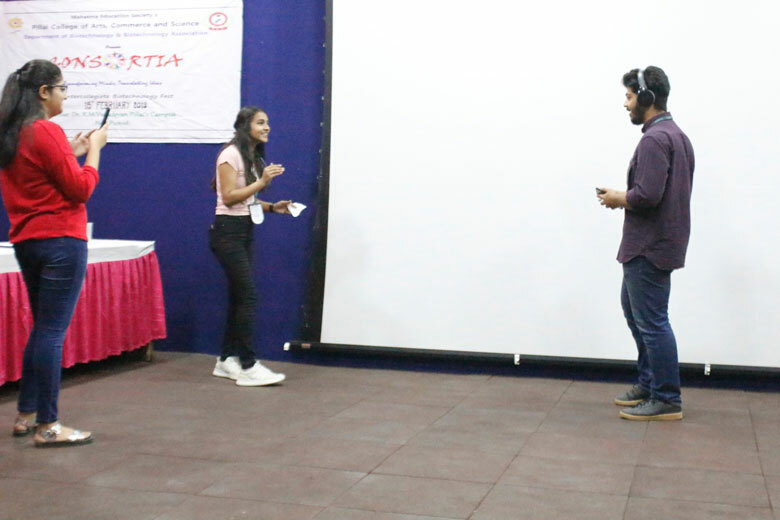 The next event was BIOPOEM which was judged by Ms. Rupali Nanekar, Assistant Professor, CKT College and Ms. Suparna Deepak, Assistant Professor, Department of Biotechnology. The stage was set on fire by the winner and the runner up. The event was enjoyed by all. Following it was READ MY LIPS. The event had the maximum participants with two rounds of elimination. Refreshments were provided to all the participants. The creative events were conducted in the lab and corridor. 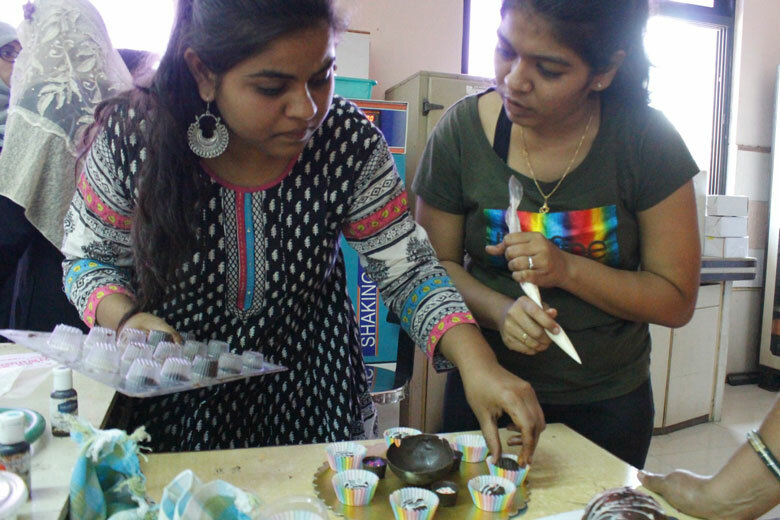 CHOCOLATE MAKING was conducted in the lab and the judge for the event was Dr. Seema Somani, Associate Professor from Commerce Department, PCACS and Ms. Bhakti Hirani, Assistant Professor, Department of Biotechnology. BIORANGOLI was conducted in the corridor and class as there were many participants. The judge for the event was Ms. Rupali Nanekar and Ms. Ashwathi Gangadharan, Assistant Professor, Department of Biotechnology. Both the event participants were given 1 hour. 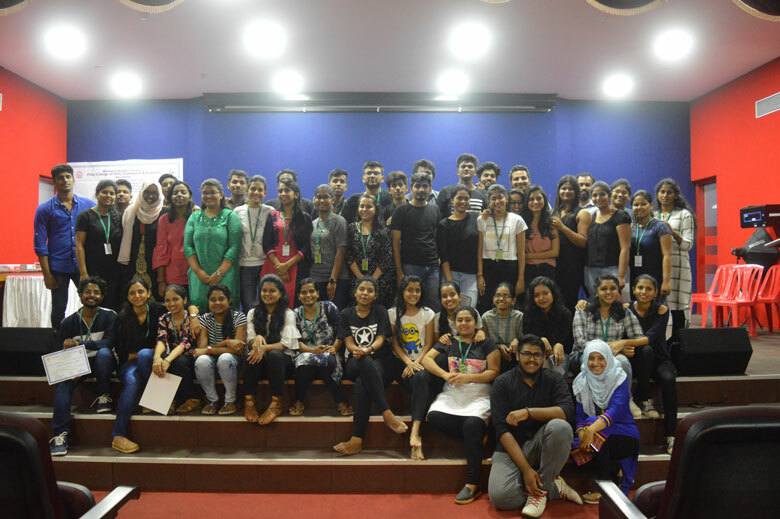 During this the participants of Zoom In presented the photographs and the event was judged by Mr. Jacob, Cinematographer and Mr. Gopakumar Pillai, Assistant Professor, Department of Biotechnology. 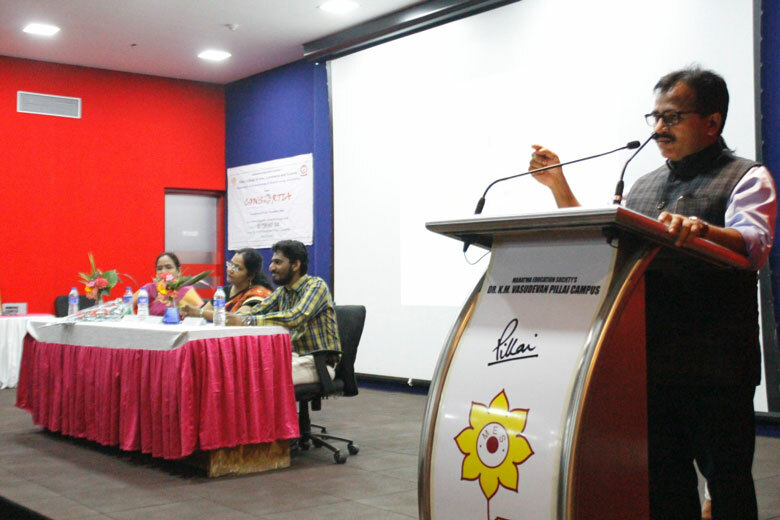 The fest was brought to an end by a valedictory speech by the president of Biotechnology Association, Ms. Hema Patil. Everyone went home with a smile and lovely memories making the fest ‘Consortia- Transforming minds, translating ideas’ a successful one. 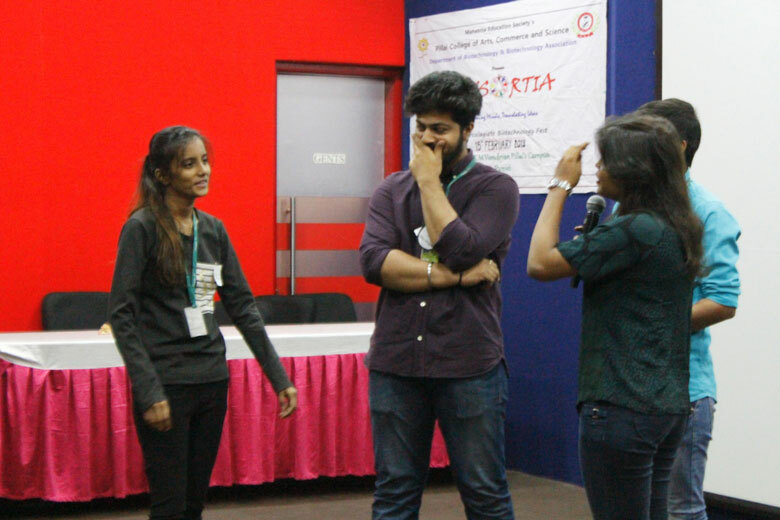 The second most enthralling event of Biotechnology Association named 'BIO-SKIT' was conducted on 4th October, 2018, Friday, in the Auditorium of Pillai College of Arts, Commerce and Science at 11.00 a.m. Each and everyone experienced an amazing kind of learning technique. 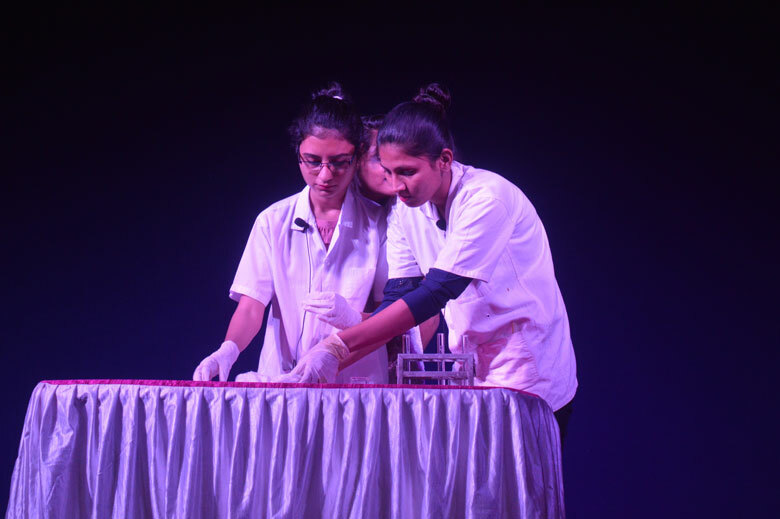 Apart from the regular chalk and board learning method, 'BIO SKIT' was planned to make students learn biological processes and mechanisms in a dramatic way by various acts performed by the students itself. It also gave the students the opportunity to showcase their acting talents. 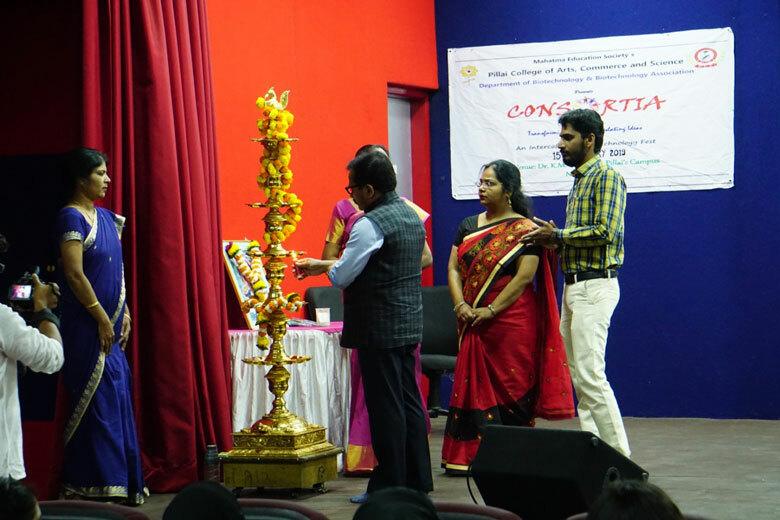 The event was inaugurated by lighting the "DIYA" by the faculty in the auditorium. Acts performed included a variety of topics focusing on drug addiction, mechanism of cancer and various other immunological processes which affected health. 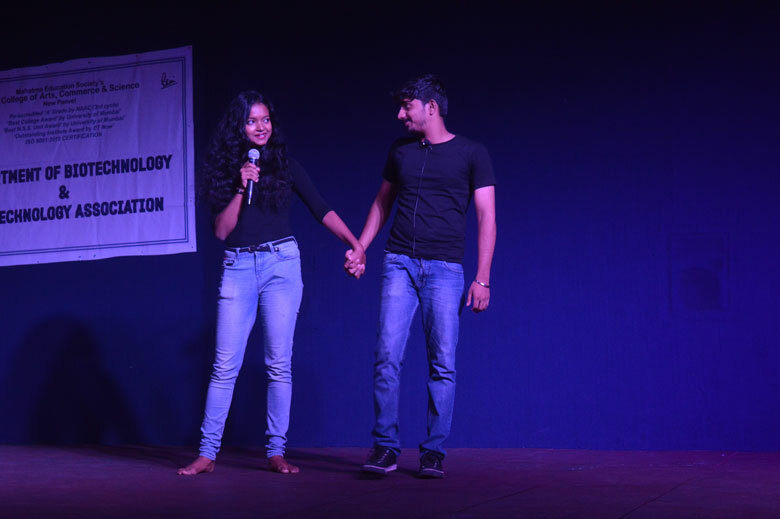 Audience gave a loving response as the acts included comedy punchlines, songs, poems and mind blowing scenes. There were total six teams consisting of 8 members each. The event was hosted by very talented S.Y. B.Sc. students Miss. Bhagyashree and Pristo Paul which added extra zeal to the event. 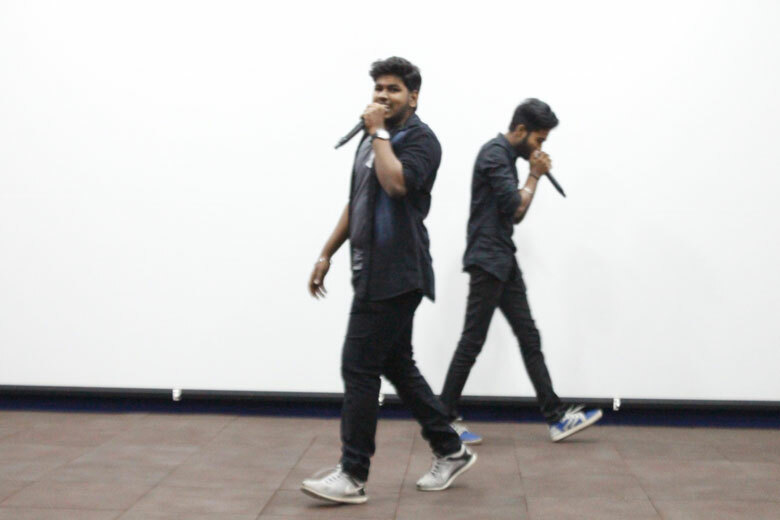 Based on the concept and the perfect performing skills, the judges for the event, Mr. Gopakumar Pillai and Dr. C. K. Prashanth evaluated the performances and gave kind remarks to the participants for their hard work and tips for giving a better show next time. All the classes of Biotechnology participated with huge enthusiasm and even the first year students showed an active participation and enacted very well according to their level of understanding the subject. By promising to keep the zeal same for the rest of the year, the event concluded with a group photograph of all the participants and the teachers and bunch of happy minds filled with inspiring knowledge. The Department of Biotechnology and Biotechnology Association continued its campaign for women's rights and safety by organizing a street play Dastak (Voice against atrocities on women) by the students of the department of Biotechnology at the New Panvel Railway Station. Protesters demanded that the government draw up a comprehensive plan to ensure women's safety and that people react to such heinous crimes and also help victims who fall prey to such injustice. The play was Written, Directed and performed by the first and second year students of the B.Sc. Biotechnology stream. A student of the department said, "It is important to voice women's issues. People are angry due to the lawlessness. A strong public reaction is required to send out the message that women's rights must be respected. The administration must ensure a safe environment for women." The play was based on the different threats faced by women in the country and was performed on the 24th January, 2014 it was a ten minutes play and stirred many emotions on the onlooker. The association is known and recognized for always taking up topics and themes that are off thebeaten path and keep adding new elements to perceive and practice things. Seminar on "Industry Academia Interface: Horizon for Future"
The Department of Biotechnology and Biotechnology Association of Pillai College of Arts, Commerce and Science (PCACS), New Panvel, organized a one day seminar on "Industry Academia Interface: Horizon for Future" on 15th September, 2012, Saturday. 110 students from different colleges including PCACS participated in the seminar. The distinguished guests formally inaugurated the event by lightening the lamp. Dr. Daphne Pillai, Principal, PCACS welcomed the gathering. In her speech she emphasized on the importance of industry academic collaboration. Dr. A. K. Kohli, Chief Executive Officer, Board of Radiation and Isotope Technology B.A.R.C. delivered the keynote address. In his converse he explained the significance of radiation and radioisotopes and its application in different fields like medicine and agriculture. At the end of his talk he gave the guidelines to the students with respect to different exams conducted by B.A.R.C. for research program. The technical session started at 11.30 a.m. by Dr. B. V. Vakil, Research In charge, G. N. Khalsa College, Consultant - Biotech and fermentation industries. He spoke about "Opportunities for Biotechnologists and Expectations of Biotechnology Industry". He also stressed on the role of Teachers as well as the responsibilities of students to prepare themselves to face the challenges in the future. The afternoon session started with the talk of Mr. Babu Rao Bussari, Assistant Manager, Serum Institute of India Ltd., Pune on the topic "Introduction of Biotech Industry and Overview of Vaccine Manufacturing Techniques". The topic covered by him was types of vaccines, fermentation process and recovery process. Mr. Rajendra Chandane, Assistant Global Project Manager, Glenmark, Mumbai and Mr. Rohit Mane, Quality Assurance Executive, Reliance Life Sciences, Mumbai accentuated the contribution of Educational institutions in grooming the students with quality education and preparing them industry ready. At the end of the session participation certificate was given to all the participants by Dr. K. M. Srinandhini Devi, Convener of the Seminar. The seminar was appreciated by all the participants and the infotaining event came to an end by 5.30 p.m.